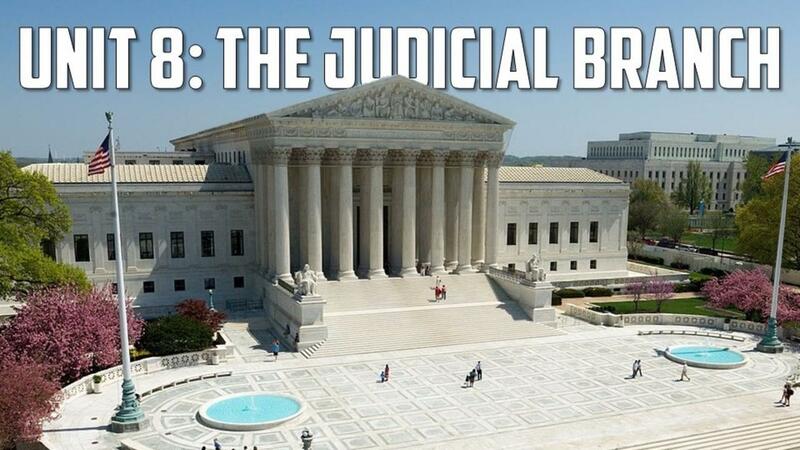 After covering the Legislative and Executive Branches comes the final unit for the Branches of Government with this unit on America's Judicial Branch. Remember, you get immediate access to this engaging and thorough unit plan when you join Students of Civics! The unit begins with a great discussion starter activity to get students thinking about how "law" and "justice" are debatable and sometimes what is right and wrong is not always so clear. Then you move on to a PowerPoint and guided notes sheet on the American judicial system so students understand courts, trials, and how the system is structured. 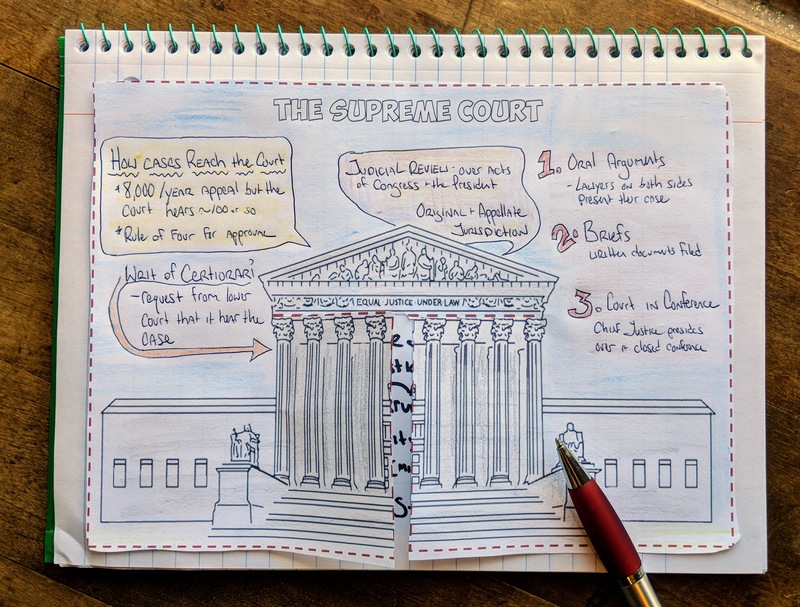 The next day explores the US Supreme Court with a PowerPoint, interactive notebook page, DBQ, and activity to help students understand the highest court in the land. Day 3 continues on the Supreme Court with a lesson on Judicial Review and the court's power to declare acts of Congress unconstitutional. Students also begin looking at specific court cases throughout history to prepare them for the PBL assignment. Next students learn about Judicial Restraint vs. Judicial Activism and hold a debate / Socratic Seminar after reading about the two philosophies. 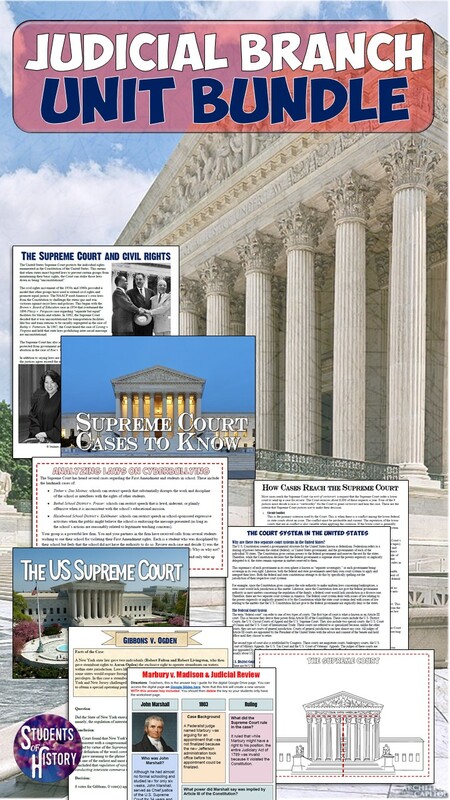 The next several days are devoted to a Project Based Learning (PBL) assignment on landmark Supreme Court Cases. Everything you need is provided for you with instructions, suggestions, and a rubric for students. Each student is assigned a landmark case like Gideon v. Wainwright, Brown v. Board of Ed., or Tinker v. Des Moines. After your students spend time researching, working on their projects, and presenting, a PowerPoint and guided notes set on all the cases is provided so you can be sure all your students understand the significance of each case. The last lesson plan in the unit is an important one on Cyberbullying and the law. This is a meaningful one for students now and focuses on online harassment, texting, and the repercussions these can have. A definitely powerful last lesson plan for the unit. Finally, there is a day dedicated to review with multiple review games, worksheets, and activities before moving on to an editable assessment to close out the unit! Also included with each day's lesson plan are suggested videos and all the downloadable resources you need for engaging class periods that you and your students will enjoy! You can download this unit now individually here on TpT! If you want this unit plus all the others for Civics, join Students of Civics today and you'll get immediate access to ALL of these awesome resources plus hundreds more for every other unit in Civics and American Government!